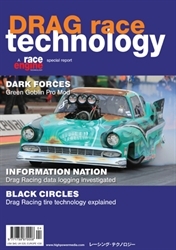 Volumes 1 - 9 of Drag Race Technology delivered immediately. This offer saves you 20% over buying the issues individually! Please click "Details" to see the full contents of each issue. Highlights in this issue include a conversation with Rahn Tobler and a dossier on Jeff Lutz' 57 Chevrolet. Insights into the Liberty Extreme-T trasnmission, the Noonan 4.9 Hemi Engine & the Honda S-Dream Bonneville Streamliner. We report on the Red Victor 3 and the Mexxspeed Ghia Pro Nitrous as well as a focus on safety equipment. Please click 'Details' for full contents. Highlights in this issue include a conversation with Tim Wilkerson as well as a dossier on the Vance & Hines Screaming Eagle Street Rod. Insights into traction control, dynamic ride height adjustment, nitrous & EFI. 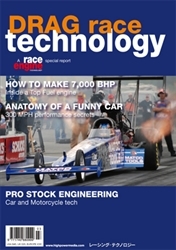 We look at the Prock Performance Drag Radial Corvette & the Robert Tighe Racing Scion as well as an overview on rear gears.The issue also includes our full list of Drag Racing suppliers. Please click 'Details' for full contents. 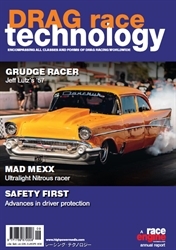 Highlights in this issue include insights into torque converters, parachutes, and brakes. We look at anti-squat in drag racing as well as the new Pro Stock rules. A special investigation into the Triumph Rockey LSR bike, a dossier on the John Force Camaro and our full list of drag racing suppliers. Please click 'Details' for full contents. 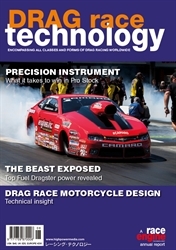 Highlights in this issue include a dossier on the Elite Motorsports Pro Stock Camaro as well as insights into top fuel power and motorcycle chassis design. A profile on the Street Eliminator Supra, a look at the Red Victor 3 and a conversation with John collins as well as a focus article covering fuel supply systems. Please click 'Details' for full contents. 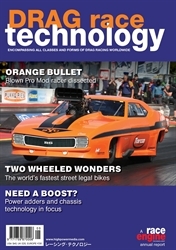 Highlights in this issue include a dossier on the Pro Mod Camaro as well as an insight into the the Pro Street Hayabusa & Beetle Doorslammer. In conversation with Jimmy Prock as well as focus articles covering steering, suspension, brakes & power additives. Please click 'Details' for full contents. 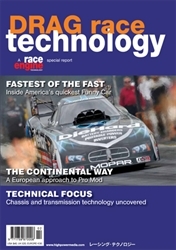 Highlights in this issue include a dossier on the Green Goblin, tech reviews on powertrain, chassis & tires. A look at the Black Current Beetle and the Harley Davidson Pro Stock as well as focus articles covering suspension and data systems. Please click 'Details' for full contents. 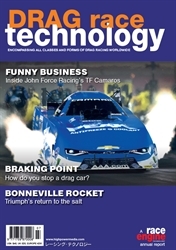 Highlights in this issue include Profiles of the Erbacher Racing Top Fuel dragster and a Top Fuel Hydroplane plus Focus articles covering Sportsman Chassis and Engine Supply Systems. Please click 'Details' for full contents. Highlights in the issue include Profiles of the Die Hard DSR Funny car, a Studebaker Pro Mod and the Pro Stock Suzuki GSX-R plus a Focus article covering Transmission. Please click 'Details' for full contents. 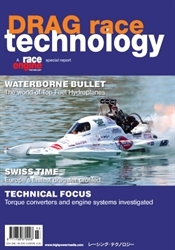 Highlights in this issue include an Insights into Top Fuel engines and Running a Top Fuel car plus a Focus article covering the Sportsman Categories. Please click 'Details' for full contents.